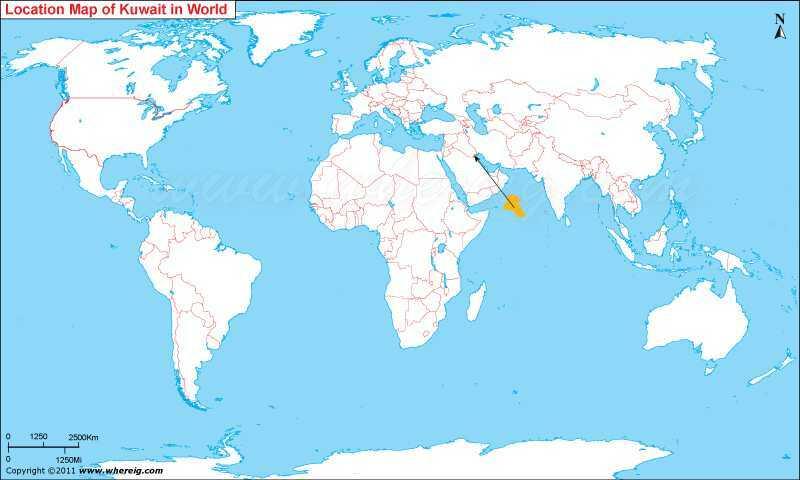 Where is Kuwait located on the world map? Of course, Kuwait is a small sovereign Arab nation but it is well know country located in the northeast of the Arabian Peninsula in Western Asia. It shares its international boundary with Saudi Arabia in the south and Iraq in the north. However, its eastern and south-eastern extension is limited by the Gulf (Persian Gulf). The name Kuwait is not given randomly rather it has a beautiful meaning derived from the Arabic "akwat", meaning is fortress built near water. Furthermore, the country�s economy is largely guided by export of oil. Kuwait's large oil fields had been discovered first time in the late 1930s. After the independence of the country, Kuwait�s oil industry experienced exceptional economic growth. Kuwait has the world's fifth largest oil reserves and petroleum products. Now it accounts for about 95% of export revenues. Surprisingly, Kuwait has some of the world's richest oil fields for example Burgan field having a total capacity of approximately 70 billion barrels. Government type of Kuwait is a constitutional monarchy with a parliamentary system of government. In terms of per capita income, Kuwait is 11th richest country. Kuwait has one of the most vocal and transparent media, which much liberty in the Arab World.